Looking forward to Saturday’s encounter between Roger Federer and Nick Kyrgios, their fourth meeting, many of us wondered if the Australian would bring his A game and do what he often does not – play sustained, serious tennis. We may have overlooked a more important consideration: What if Roger Federer brings his A game? Federer brought that and more to this marquee, third-round matchup. The Swiss star demonstrated his full, rich complement of artistry and tennis smarts, and he schooled the upstart Aussie. The 37-year-old was focused, spry and creative. He played world’s greatest headmaster to Kyrgios’ undisciplined student. Kyrgios began eager and studious but finished the match befuddled. 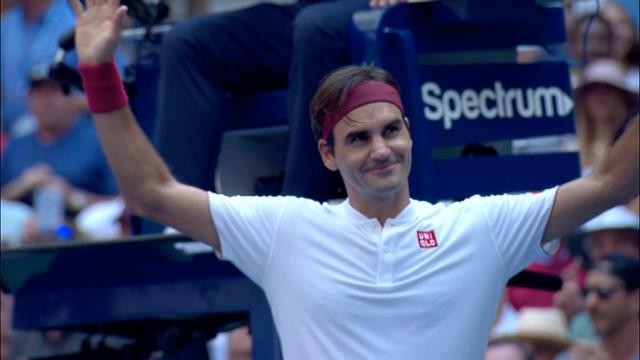 If the match didn’t develop into the razor’s-edge classic the two’s respective talents and previous matches might have indicated – nine of 10 sets had gone to tiebreaks – it was still a spectacle of Roger Federer’s continued command of the game. SEE ALSO: How do we assess Nick Kyrgios, the person and player? A debate rages. Federer was tactical, he was forceful and he was artistic. Unlike a Federer or Rafael Nadal, who are so adept at problem solving and adapting their games to unique situations and challenges, turning to backup plans as necessary, Kyrgios had nowhere else to turn when his simple Plan A didn’t work. In the first set, that plan was working. Kyrgios sailed through his first four service games, bombing deliveries and winning free points. Federer was the one who looked ill-prepared, and the Australian earned four break points midway through the set. When Kyrgios couldn’t capitalize, Federer pounced, snatching the set with a chipped backhand down the line, the shot that Kyrgios earlier this week called the Swiss’s finest. From there, it was Federer in full flight. He carved up Kyrgios with a handful of wickedly sliced backhand drop shots, a weapon that belongs exclusively to the Federer textbook, and turned the second set into a clinic. In an alternative universe, where natural talent is the only determinant of success, a match between Roger Federer and Nick Kyrgios might be a major final rather than a mere third-rounder on Labor Day weekend. SEE ALSO: Roger Federer defeated Nick Kyrgios, 6,4, 6-1, 7-5, to advance to the fourth round of the 2018 US Open. But tennis, like most things, requires much more than raw talent. Things like application, determination, focus, a positive attitude. Most keen tennis observers would agree that they are two of the most naturally gifted players in the game. They are far from mirror images, however. If their skills are related, their demeanor could hardly be more different. Federer is calm, precise and cerebral. The hot-headed, mercurial Aussie is not. Yet more intriguing than their divergent personalities is the comparison in their games. Both have penetrating, flicked forehands. Both possess huge offensive serves; Federer’s surgical placement sets up his first-strike ball, while Kyrgios’ is all about velocity and action. And both players have incredible feel and touch, soft hands that produce delicate shots and angles. But perhaps where Federer and Kyrgios are most closely aligned is their penchant for creativity. Federer has almost 20 years of highlight-reel footage in the bag, with more shots than you can count that make you think: “How on earth did he do that?” There are tweeners for winners, ridiculous sidespin droppers, leaping overheads. But they’re employed sparingly, and rarely on crucial points. "We need the fun. We need the variation to everything, but he takes it to the next level." Kyrgios, on the other hand, seems drawn – whether by boredom or insolence – to trick shots and wild swats as a matter of attitude. After his first-round match here, Roger Federer was asked by John McEnroe about the Australian’s on-court tomfoolery. Federer – himself no stranger to tennis as entertainment – said, “I think he finds it hard to not do any of those tricks. On Saturday afternoon, the point of the match – of the tournament, really – belonged to the master. At 3-3 in the final set, Kyrgios, close to net, produced a sharply angled dink crosscourt. Federer raced forward in the right doubles alley. He reached the ball just before a second bounce and scooped a forehand worm-burner around the netpost, perhaps six inches off the ground. The ball skidded into the back corner for a spectacular winner. Kyrgios stood in awe, smiling, trying to engage Federer in a light moment. Federer merely turned and retreated to the baseline, a small acknowledgment of the crowd’s thunderous applause but otherwise all business. Kyrgios was left to stare at the replay on the Jumbotron, grinning widely. September 1, 2018 - Roger Federer prepares to enter the court prior to his match against Nick Kyrgios at the 2018 US Open. September 1, 2018 - Nick Kyrgios prepares to enter the court prior to his match against Roger Federer at the 2018 US Open. September 1, 2018 - Roger Federer shakes hands Nick Kyrgios after their match at the 2018 US Open.